No child wants to think they're unwanted. 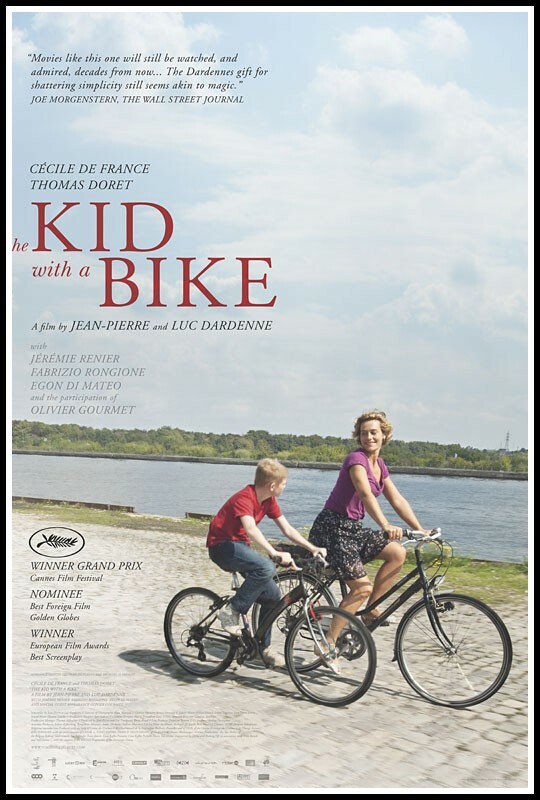 That's why in THE KID WITH A BIKE (Le Gamin au vélo), despite all evidence to the contrary, Cyril (Thomas Doret) clings to the belief that his deadbeat father (Jérémie Renier) is going to come back to retrieve him from the foster home he's been “temporarily” placed at. Even when his counselors tell Cyril that his father has moved, leving no forwarding address, Cyril refuses to believe them. Cyrill finally manages to escape long enough to go there himself, at which point he finally has to face the truth. On top of that, Cyril's prize possession, his bike, is gone. The only bright spot is that Samantha (Cécile de France), a hairdresser Cyril encounters while eluding the foster home staff, asks to be the Cyril's guardian on weekends. She also manages to get the boy's bike back. As nice as Samantha seems, it's not surprising that Cyril has a hard time trusting her. And despite what he's learned about his father, Cyril is still determined to track him down, certain that he'll be taken in again. This isn't one of those sappy movies where a cute little orphan melts some crusty old curmudgeon's heart and everyone lives happily ever after. There are heartwarming aspects to the story, but nothing that feels phoney or overly sentimental. Cyril is a good kid at heart, but he's also troubled; going down the wrong path is very much a possibility for him, thanks to a shady substitute father figure (Egon Di Mateo) he falls in with. And while Samantha is a kind and caring person, she is definitely pushed to her limits by the boy. At no point do we ever feel like a happy ending is guaranteed. 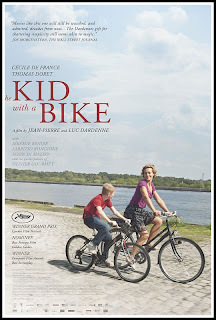 Co-writers/directors Jean-Pierre and Luc Dardenne are best known for their realist approach in films like THE CHILD (L'enfant), but for THE KID WITH A BIKE they intended to have more of a fairy tale feel. That aspect is certainly there, but in a very subtle way. The most prominent break from the brothers' usual approach is the use of some non-diegetic music to emphasize certain emotional moments. For the most part, though, in terms of look and performance THE KID WITH A BIKE still maintains a very naturalistic tone. It's shot in a matter of fact, almost verité style, and the cast all give understated, believable performances. 3 1/2 out of 4 stars.